We’ve had a looong school holiday break! Two months of summer to enjoy at home together. It turned out to be two months of mostly rain, which by necessity changed our holiday plans somewhat, still I am so grateful that the worst we were affected by the flooding in South-East Queensland was a terrible case of mould in our house (and everything inside the house). In two months we’ve had an awesome beach holiday, a fabulously relaxing Christmas, lots of fun playing and swimming in the rain – we’ve watched our chickens grow from chicks to (very hungry) teenaged chickens (and learned about life and death when we found a carpet python with a chicken-sized lump in it), learned about dogs as we took care of Brutus for a few weeks, bush-walked and swam in the rain, camped (in the sunshine! ), hung out with friends when we could … the children have grown longer (and louder! 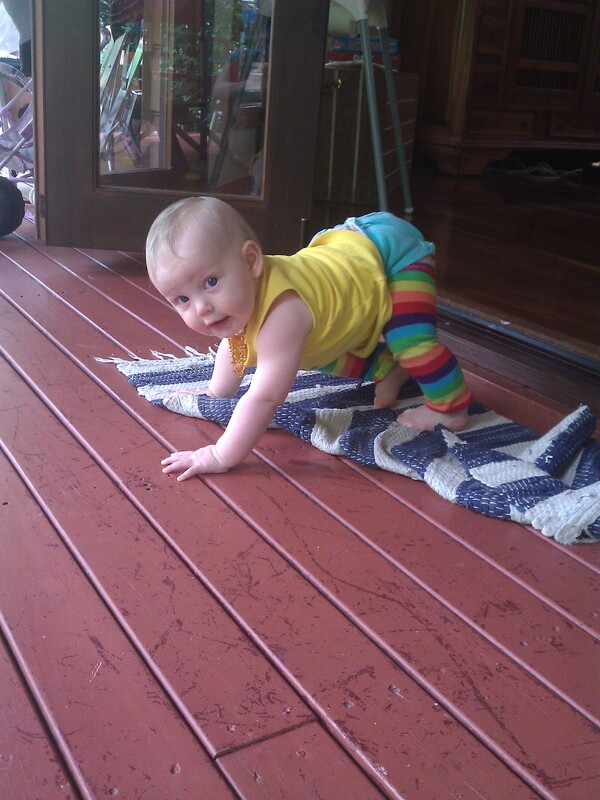 ), the baby is crawling, so much has been going on. It has been fun and colourful and zany … and now I am looking forward to it all ending!! I’m looking forward to having time to address the pile of unanswered emails and mail waiting for me. Time to start sewing doll kits and making dolls and rolling felt. Time to work through that list of “Things To Do” that is usually quite manageable when we are living a rhythmic, predictable and non-zany life. I know my kids are looking forward to a more monotonous and predictable existence. I can tell because their behaviour (and mine) is definitely experiencing a drop in standards! Roll on school! And little Linden has been setting the pace for us all this time – I feel like surrounding her in flashing neon lights that say “Everyone!! 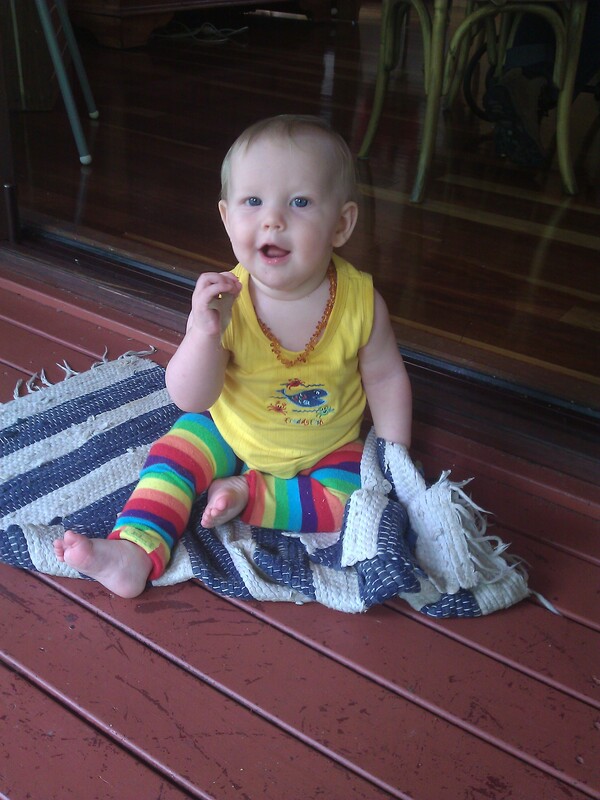 Look at this child while you can and feast your eyes on her because in the next five minutes she’ll have changed again! 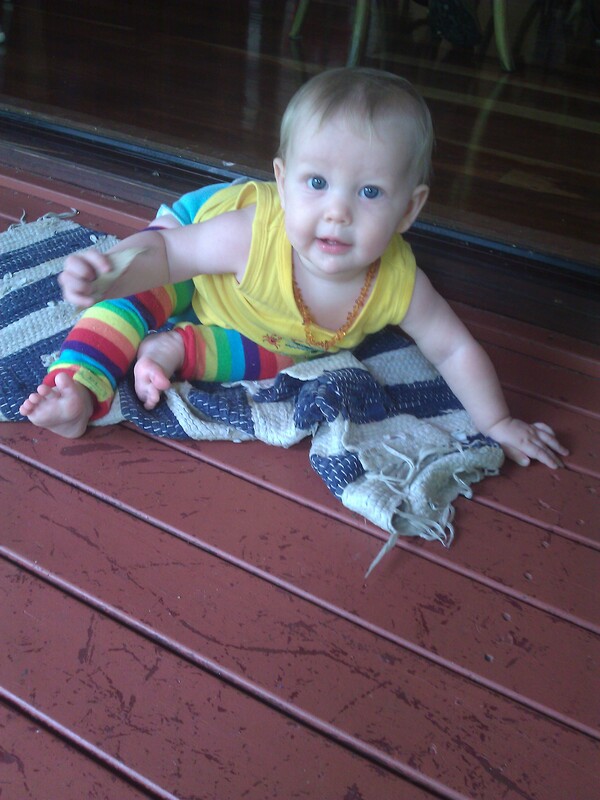 !” Linden is now really enjoying the freedom of movement with her little robotic crawl. She is experimenting with the world of food as she tries a few new tastes. She’s not a newborn anymore. I must have blinked, because I’m sure she was only just born a few weeks ago! !